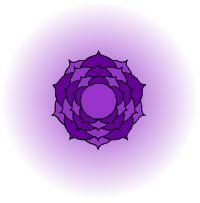 A balanced crown chakra brings you great gifts - a magnetic personality, the capacity to perform what other may see as "miracles", transcendence and the sense of being at peace with who you are. A balanced CROWN Chakra connects you with message from higher realms. Can be experienced as a pressure on the top of the head. Miracle worker, can transcend the laws of nature, total access to the unconscious and the subconscious. peaceful and quiet surroundings helps.